Quantum sensors (often called PAR sensors) are increasingly used to measure photosynthetic photon flux density (PPFD, units of µmol m-2 s-1) underwater, which is important for biological, chemical, and physical processes in natural waters and in aquariums. When a quantum sensor that was calibrated in air is used to make underwater measurements, the sensor reads low. This phenomenon is called the immersion effect and happens because the refractive index of water (1.33) is greater than air (1.00). The higher refractive index of water causes more light to be backscattered (or reflected) out of the sensor in water than in air (Smith, 1969; Tyler and Smith, 1970). As more light is reflected, less light is transmitted through the diffuser to the detector, which causes the sensor to read low. When this effect is not corrected for, underwater measurements are only relative, which makes it difficult to compare light in different environments. 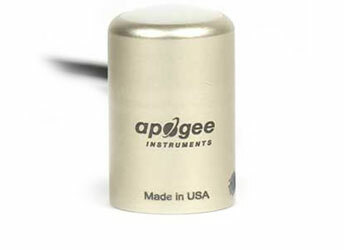 The Apogee Full-Spectrum Quantum Sensor (model SQ-500) is more spectrally accurate than the Original Quantum Sensor (model SQ-120), but the unique optics (mainly the shape) cause the immersion effect to be larger for the new sensor. Underwater PAR measurements collected using a full-spectrum sensor can be corrected by multiplying by 1.32; measurements collected using an original Apogee sensor should be multiplied by 1.08*. *The MQ-210 and MQ-510 Underwater Quantum Meters already apply the immersion effect correction factor to the meter readings through the meter firmware. 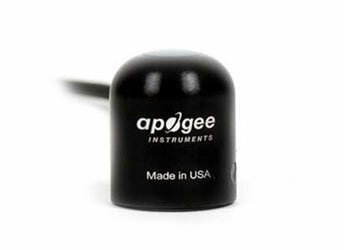 Additionally, the SQ-420 and SQ-520 have an "Immersion Setting" that applies the immersion effect correction factor to the sensor readings through the ApogeeConnect Software. These sensors do not need post-measurement corrections applied to their measurements.